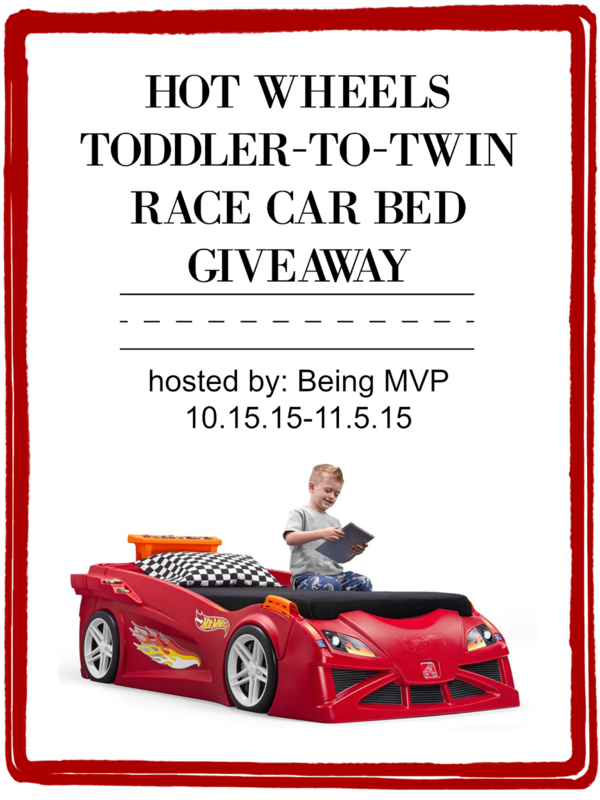 Welcome to the Step2 HOT WHEELS™ TODDLER-TO-TWIN RACE CAR BED Giveaway hosted by Being MVP. Young racers will be off to dreamland at 100mph in the Hot Wheels™ Toddler to Twin Race Car Bed by Step2. This kid’s car bed will make the transition from a crib easy and fun. Die cast car enthusiasts will love showcasing their Hot Wheels™ collection on the air intakes and spoiler. It grows with your little one as it transforms into a twin bed. Race away with fun for years to come with the Hot Wheels™ Toddler to Twin Race Car Bed! Made in USA of US and imported parts from China. 2015 Mattel, Inc. All rights reserved. Hot Wheels is a registered trademark of Mattel. Check out the review at Being MVP and enter to win a Step2 HOT WHEELS™ TODDLER-TO-TWIN RACE CAR BED! Giveaway runs from October 15-November 2, 2015. Open to US residents. My 2 year old son. He would love this fun bed. It might actually make him stay in his own bed! My son would love one of these. He’s been begging for one for a long time! My nephew would love this as he transitions out of his crib. He’s obsessed with cars! This bed looks AMAZING!! Can’t imagine what my little guy would say if it appeared in his bedroom one day! I have a nephew that would love this bed…. Have been trying to get my little one to sleep in a bed! This would be perfect!!! He would love it, and hopefully sleep in it every night! My youngest son is the fan & would love this! I had this bed many years ago for my first of 4 children and I loved it and he loved it. I would love another one for our little! My grandson is the “speed racer”! He would LOVE to have one to sleep in besides his cars that he LOVES to play with!! my 2 year is obsessed with hot wheels!thanks for the chance to win! My daughter is a big fan of hot wheels and just loves cars.She would be thrilled to have this ! My nephew would love this bed because he’s always obsessing about race cars and trucks. My son is my little racing fan. He would be in 7th Heaven if he had this bed! Thanks for the opportunity to win! ! My niece is my racing fan and she would love this -yes she is a girl, but I think she is the next Danica Patrick!! Thank you for the chance. My nephew LOVES cars! and he is just about to go into his first big boy bed! This would be such a great surprise! My son would love this bed, because he loves cars and anything that goes! My son loves cars! He would love this bed. My son would absolutely love this bed.